Home / Techiebeez India / TECHNOLOGY / TVS / Edge-Lit LCDs VS Direct-lit LCDs | ELED TV VS DLED TV : Which is better? | LCD Vs LED? 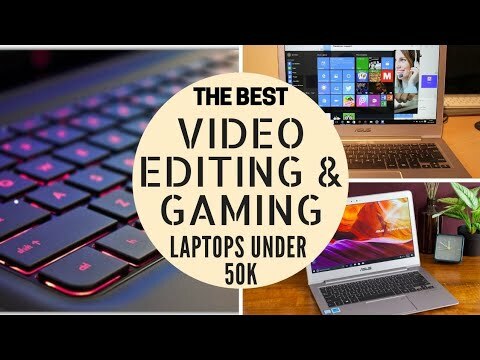 ELED TV Vs DLED TV | Find out which is better! Most people find themselves entangled in a perplexing situation while choosing the right TV for themselves. Buyers of big brands like Sony, Samsung and LG see their purchase as a safe deal as they are established brands and we have seen their performance for a long time now. However, individuals seeking to choose from amongst the budget offerings are the ones who are more likely to get confused in selecting the right TV that could be the best bang for their buck. This article will give you an insight into the technical aspects of different TVs and by the end of this write-up, you yourselves would be armed with adequate technical knowledge to choose the best TV for yourself. LCDs. What we refer to as LED is simply an update to the existing LCD panels. The panel technology is the same, however, the backlight is entirely different. Those LCDs that use LEDs as a light source are generally termed as LEDs. 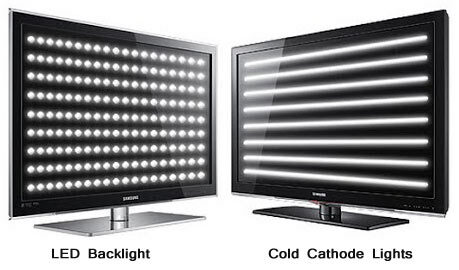 In short, a LED-backlight is a replacement for the uniform CCFL (Cold Cathode Fluorescent Light) backlight that previously gave LCD TVs its brightness. Initially, there were only CCFL-backlit LCDs, but with advancement in technology, these CCFL were replaced by LEDs, as not only they dramatically reduced power consumption by over 40 percent compared to conventional CCFL-backlit LCDs, we got more control over the image quality by modulating these individual LEDs. 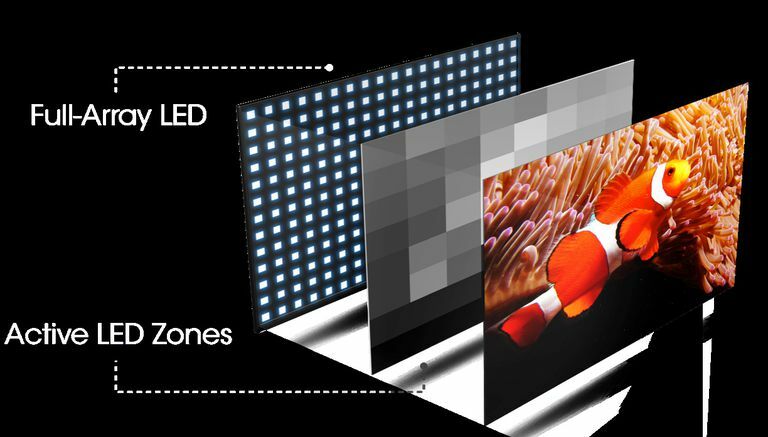 In the LED-backlit LCDs, LED lights can switch on and off individually, which allows the image to have greater contrast, bright whites and deep black in the same image. Thus, producing a superior picture when compared to CCFL-backlit LCDs. LCD TVs with LEDs also offer better response time in comparison to CCFL-backlit LCDs. In the traditional LCDs, the CCFL lights were spread all across the surface behind the display screen, but there was no control over them. It means that when we switched on our TV, the entire surface behind the screen used to get illuminated by these CCFL lights that were always ON, and we were unable to control their dimming in specific areas of the screen. Because of this, even the dark part of the picture used to be illuminated like the rest and we were unable to achieve images with convincing blacks, as light passed through the dark part of the picture and made it appear grey. In other words, the contrast of CCFL-backlit LCD panels isn’t very good. However, a plasma TV doesn’t have this problem as each pixel can light up or switch-off according to the demand of the picture. Now coming to LCDs that use LEDs as the source of illumination, there are basically three types. One is Full-array backlighting, another is Edge-lit backlighting (ELED) and third is direct-lit LED backlights (DLED). The term full-array is used where LEDs cover the entire back-side of the LCD panel. Full-array TVs are high-ends TVs that are heavier and often thicker, but they provide better picture quality as all parts of the screen are evenly backlit. They offer the most effective local dimming, as the LEDs are more in number and are spread over the entire back surface of the panel. 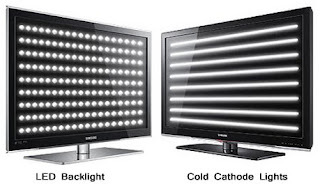 The independent dimming of each LED in these TV sets helps in achieving perfect blacks. But, as they are costlier to manufacture, they are rare. 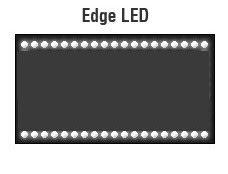 Edge LEDs use an array of LED backlights along the outer edges of the screen that use lightguides or diffusers to fire light across into the centre of the screen. This technology allows the designing and manufacturing of exceptionally thin TV sets. 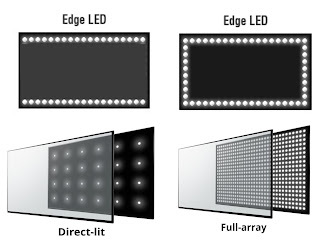 Edge-lit sets also have a cost-benefit over direct, local dimming versions (DLED) as fewer LEDs are used in them. Because of which, they are power efficient too. However, technically, it is the least effective system in terms of achieving a high contrast ratio as it does not offer ‘local dimming’. The black levels are not as deep and the edge area of the screen has a tendency to be brighter than the centre area of the screen. The Edge TVs not only struggle to produce a high contrast, they can also get affected by Murra Effect, which can cause light to bleed from sides to gradually overpower the entire screen. Direct-lit LED backlights are an offshoot of full-array backlighting, though they use significantly fewer LEDs across the back of the panel. In this technology, several rows of LEDs are placed behind the entire surface of the screen. As the LEDs are behind the LCD panel in DLED TVs, dual modulation works far more efficiently and the TVs can have better overall brightness and contrast. Using a feature called local dimming, the LEDs are divided into a number of zones that can be individually controlled, so some portions of the backlight can be dimmed while other remain illuminated. 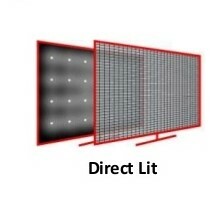 Direct-lit LEDs can have around 200+ LED lights arranged all over the screen in clusters. Visually it is the most impressive technology, though it’s more expensive and adds extra millimetres to the depth of the TV, these TVs have local dimming that improves the blackness of an image and produce best in class picture quality, with an exceptional contrast ratio of up to 10,000,000:1. They have the ability to implement new levels of peak light output and give superb motion reproduction. Some EDGE LEDs also stake claim to local dimming, but in these TVs, it is hardly able to bring the desired effect. Apart from being more expensive and adding to the depth of the TV, these DLED TVs might display ‘Halo Effect’ for bright images on a dark background, in which constellations of LED lights from behind the screen can cause bright objects to appear with a slight ring around them. Why Big TV Brands Have Better Picture Quality Despite Being ELED? Though different brand TVs might be using the same DLED or ELED backlighting, their image quality might differ considerably depending on how many lights are used and how they are aligned. In some budget Edge-lit TVs, LEDs are aligned on only one side, either upper or lower edge of the TV panel, while others might have LEDs on both upper and lower edges of the panel. The high end TVs might even have a row of LEDs on all four edges of the panel. Some manufacturers use both Edge and Direct LED systems for LCD TVs. The best professional monitors use direct LEDs. TV manufacturers lay more stress on producing TVs with ELED technology as it not only cut down upon their expenditure but allows them the liberty of producing ultra-slim TV sets that can appeal the masses with their aesthetically designed panels. Is Vu TV PixelightHDR 55 a Full Array LED or DLED LCD TV? IF U COMPARE MI 55" VS IFFALCON 55"
IF U COMPARE IFFALCCON 55" VS SHINCO 55"
ULTIMATE RESULT IS SHINCO 55"
WATCH AND TAKE A DECISION . Does vu 55inch and 50 inch 2017 differ only by size? Please Review on lg 49UK6360PTE tv.